Today, brands compete for customers’ attention via all possible channels. We live in a world where customers need instant gratification. This has marketers exploring new ways to attract eyeballs and deploy innovative tactics to stand out. On the user acquisition side, the average cost per install is $4.121 while the average cost to acquire a paying customer is an astounding $64.90. With such high acquisition costs and intensive competition, marketers face a real challenge after acquiring users: keeping them engaged over the long term. When used right, push notifications tend to perform better than other channels. However effective a channel it may be, your carefully crafted push notification is futile if it doesn’t reach all your intended recipients. In other words, marketers must ensure high delivery rates for their engagement campaigns to work. What are the potential causes of push notifications going undelivered? Note – Since Push Notifications are delivered through GCM, our servers don’t have visibility on why some messages go undelivered beyond GCM. The above numbers are a result of hypotheses and experiments we ran on a statistically significant sample set. The largest component of un-deliverability is OS level user opt-out to receive push notifications. iOS mandates that all apps ask for permission to send push notifications to users. This leads to a high 55% average opt out rate on iOS. Even on Android, the average opt out rates are at 40%. Note that these are averages and certain types of apps, for example messaging apps or ride-sharing apps, tend to have better opt-in rates. Plus, the latest versions of Android and iOS give full control to users, who can turn push notifications on or off for any app they want. 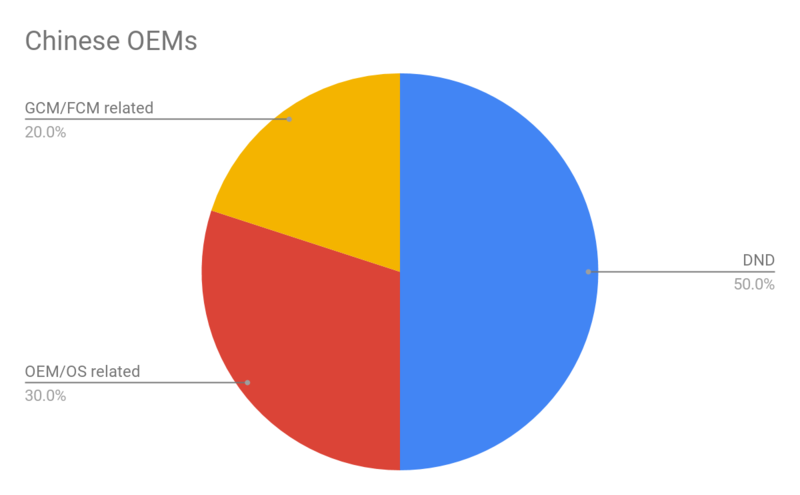 Some Android device manufacturers restrict or stop background processes that limit device connectivity with GCM, impacting push notification delivery on the device. This is particularly true for Chinese OEMs that tweak the Android OS to optimize battery life. As a result, users on Chinese devices sometimes miss important notifications such as product offers, alarm clock notifications,4 live updates, and important status updates, among other critical notifications. Users have since long complained about not receiving notifications on Huawei devices** on EMUI operating system and Xiaomi phones with MIUI5. 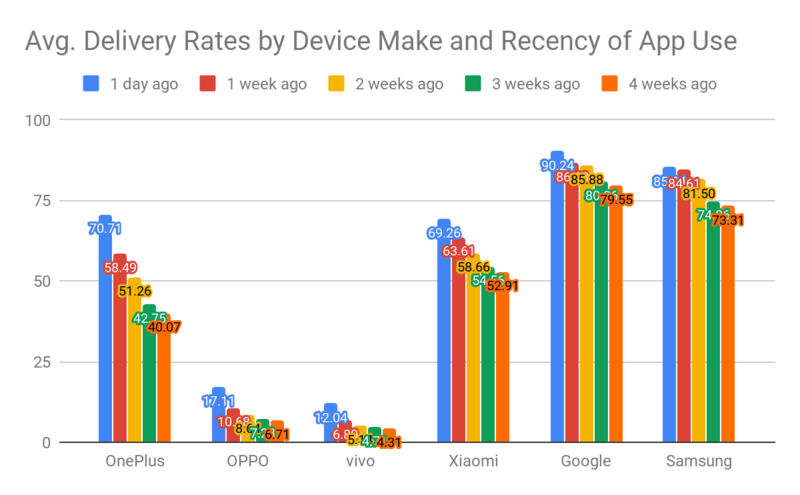 This is because battery optimization is mostly done by OEMs using some form of recency/frequency algorithm, which we believe is adaptive. Moreover, third-party battery saving apps also Force Stop other apps in order to increase battery life. This poses serious challenges for most apps, especially the ones not frequently used. 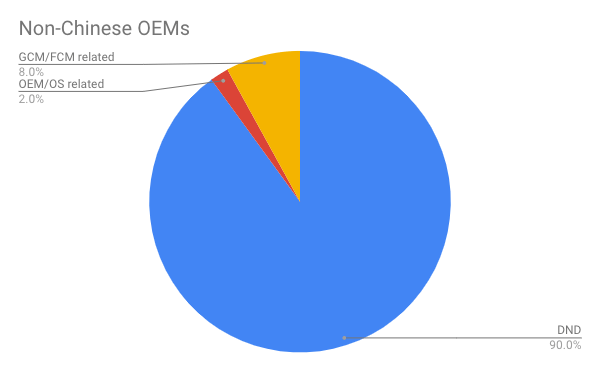 As you can see, the Chinese OEMs have very poor delivery rates of ~20% in case of recently used apps. This decreases to as low as 10% when the recency of app usage goes down. It is important to note that this delivery rate is only for users who have opted in to receive the notifications. 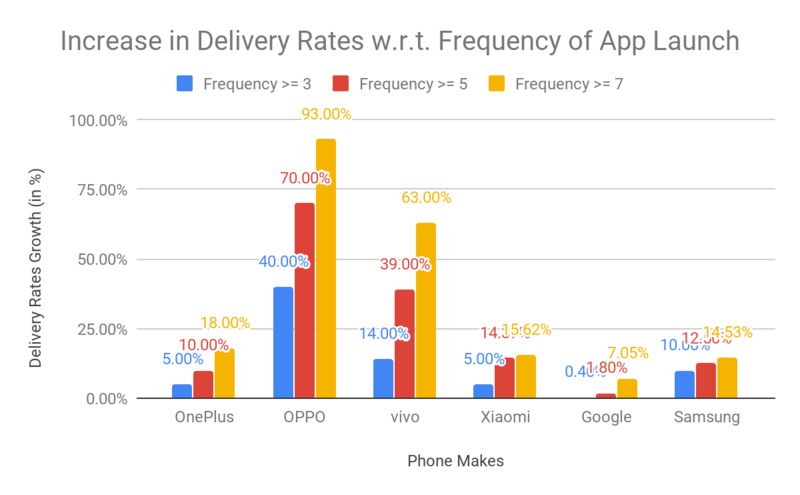 The above chart shows the abysmal push notification delivery rates for major Chinese OEMs, namely Vivo, OPPO, Xiaomi and OnePlus. As you can see, there is a marked difference when compared with OEMs like Google and Samsung. In our analysis, we also found a correlation between the frequency of app usage and delivery rates. 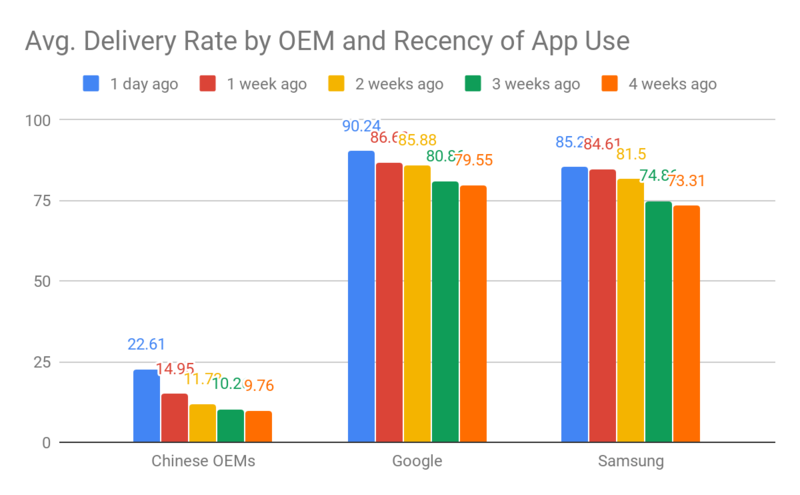 The above chart shows that OPPO and Vivo have a higher increase in delivery rates with increasing frequency of attendance (/frequent App Launches) as compared to other top Chinese OEMs and Google, Samsung. Sometimes, when a user is not connected to the Internet, GCM is unable to send push notifications. This results in delayed delivery when the connection is re-established. If the connection to device is not established within the set Time to Live (used to set an expiry date on the delivery of push notifications), the notification is undelivered. Say you have an app on Android and iOS called YourApp. Assume you’ve got 100 installs on each platform and you are now looking to engage your install base with push messages. Let’s look at how each platform might perform individually. As you can see above, the average delivery rates are ~35% for either OS. In order to address OEM issues, you can use the Push Amplification feature. This feature helps you to increase your chances of message delivery by creating an alternative mechanisms that connects with devices that you had missed using the vanilla approach. The potential upside to this is an improvement in delivery rates by close to 25% for Android. However, the battle isn’t won here. It still leaves 40% and 55% non-delivery rates (Android and iOS, respectively) on the table. Using the next option, marketers can achieve delivery rates closer to the ideal 100%. For users who have opted out of push notifications, use fallback channels like App Inbox to ensure 100% delivery of push notifications in the app. App inbox helps brands to send messages that need to stay with the user for a longer period of time. They are best suited for cases where you want to encourage users to join a gym membership (discount code that doesn’t expire) or personalize screens without too much of manual coding compared to the native app approach. Thus, using a combination of Push Amplification and App Inbox, marketers can be assured of higher delivery rates for their campaigns. This, in turn, improves overall CTRs, and eventually, conversion and retention rates.